It has been studied by generations of school pupils, but it isn’t really an easy book to read. It takes a while to get going but the rich descriptions of Scotland’s Mearns area, along with the stark honesty and sheer force of the main character’s personality, draw you in. 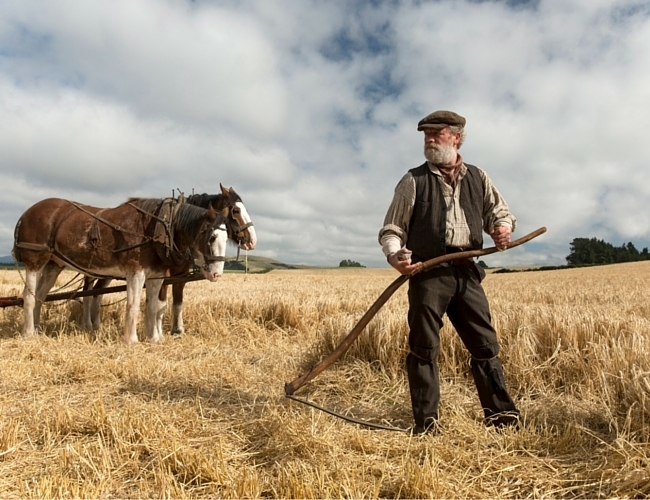 It speaks of a lost agricultural era in Scottish history. You grow to love it. James Leslie Mitchell, who wrote under the pseudonym Lewis Grassic Gibbon, was born near Auchterless, Aberdeenshire, and tells his tale in the Doric dialect. It follows farmer’s daughter Chris Guthrie, who must choose between life on the land, her Scottish identity, and the “English” part of her which draws her away from home towards books and education. She makes a decision but the way of life of her entire community is suddenly changed for ever by World War 1. Left with no choice but farming, Chris’s experiences are symbolic of the passing of a traditional way of life. Its major themes are the role of women in society, Scottish national identity and the advent of modern working methods on rural farming. The title is a reference to the sun setting over the old ways. A movie, starring Peter Mullan and Agyness Deyn, premiered at this year’s Toronto Film Festival. Some of it was shot on location in Aberdeenshire.